Knoxville Beats and Eats — Nice Work Co.
From the data gathered, we created a brand and a geotargeted online and mobile advertising campaign. Real time tracking and reporting allowed us to swap creative that was most effective to increase click-through rates. Overall, the Knoxville Beats and Eats campaign increased visits to the city and bookings at area hotels, while raising awareness of Knoxville’s cultural offerings. When Visit Knoxville hired Nice Work Company to create an umbrella brand for its spring arts, music, and food festivals, the success of the effort relied on a comprehensive communications plan. We created a survey vehicle instrumental to understanding each festival’s audience. From the data gathered, we created a brand and a geotargeted online and mobile advertising campaign. Real time tracking and reporting allowed us to swap creative that was most effective to increase click-through rates. 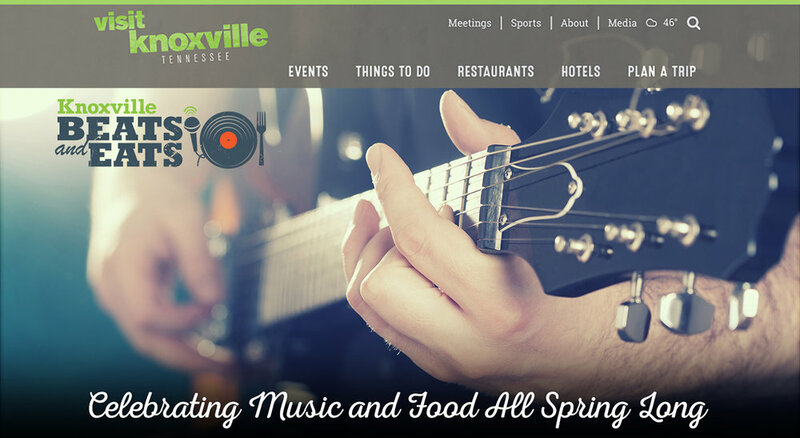 Overall, the Knoxville Beats and Eats campaign increased visits to the city and bookings at area hotels, while raising awareness of Knoxville’s cultural offerings.